← Sport – Is there a Greatest? Mike Henry, former Minister of Transport kick starting the passenger railways. 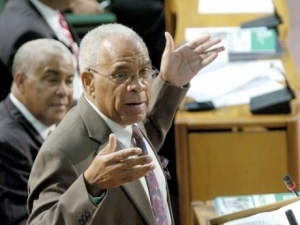 Recently, Omar Davies, Jamaica’s Minister for Transport, Works and Housing gave the impression that he was pulling the plug on the recent resurrection of the island’s passenger railway programme. I got the feeling he wanted to press the stop button there and then at the press conference he was giving. I hope Mr Davis has a serious rethink on his non-railway plans. Mr Davis showed as much passion for keeping the railways going as I have for eating mackerel. 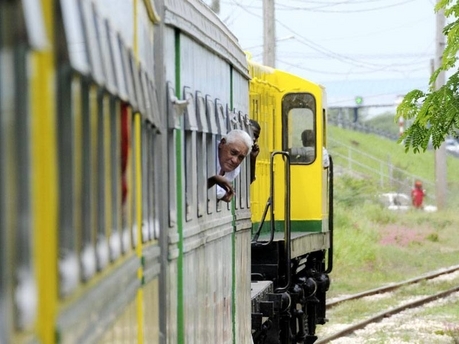 The current passenger railway programme in Jamaica was given the green light in 2011 after being closed in 1992 under the stewardship of the then ruling People’s National Party (PNP). The latest rebirth was initiated by the Jamaica Labour Party government under then Transport minister Mike Henry. Then the re-launching was open to such a fanfare and razzmatazz. The train was christened Clarendon Express as train’s first journey was from May Pen, Clarendon. Given Mr Henry is the Member of Parliament for the constituency that included May Pen, Clarendon I wonder why the first journey started there. Real head scratcher. In December 2011 the JLP lost the general election to the PNP with Mr Davies taking over the railway portfolio. Mr Davies said last week that the train is operating at a heavy loss ( over 2 million Jamaican dollars a week) and so was not financial viable. i just do not see how Mr Davis expects to make a profit from such a short rail route. Nonsense. Mr Davis, you and previous Jamaican goverments have shown such little enthusiasm for a railway programme With such little drive the railway is bound to suffer such huge losses. Please don’t kill off the railway system again. A big part of what makes Jamaica such a beautiful place may never return to the naked eye. Trains first started operating in Jamaica as far back as the 1840s. The current and future Jamaica governments should work out a long term strategy that incorporates some form of railway programme right across the 14 parishes of the island. I know this kind of development would upset some of the private taxi and mini bus operators; but they would get used to it and adapt/integrate accordingly. In fact the train infrastructure should involve long and short train lines across the island. New lines should be added and incorporate links to the 2 main international airports in Kingston and Montego Bay. We all dream of a day where we fly into Kingston from abroad and hop on a train from the airport and alight at Old Harbour, St Catherine or any parish. Well I do. Such trains could have WiFi facilities to entice the young. Even introduce music carriages, special weekend packages, season tickets and special rates for pensioners. The dream of a viable and successful railway programme is indeed possible in the long term. But governments of Jamaica just need to show a bit of vision, tenacity, and deliver a railway programme that would make Jamaicans and visitors to the island proud. The Jamaican government cannot foot the whole bill for the building of such a comprehensive railway programme . They can consult those countries that have the expertise to bring our railway programme to life. The bauxite companies in Jamaica still use the railway lines to transport their raw resources across the island; ending up at Port Esquivel in St Catherine for shipment. If the railways are good enough for bauxite companies it should be equally the same for the Jamaican public. This entry was posted in jamaica and tagged jamaica, railway, trains. Bookmark the permalink.